Have pain in the back of your thigh and are wondering if you strained your hamstring? Not sure how to tell if you have a hamstring strain? Did I pull my hamstring? 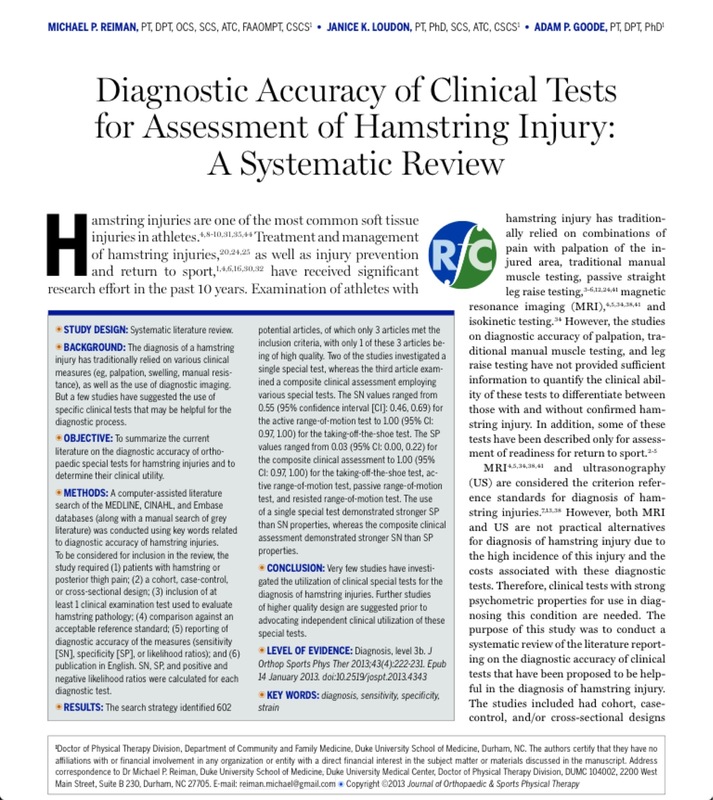 A systematic review was published in the Journal of Orthopedic and Sports physical Therapy in 2013 which pooled data from three studies that examined the accuracy of several easy clinical tests to diagnose a hamstring strain. Overall, the results were inconclusive and clinical tests can’t determine with absolute certainty the presence of absence of a hamstring strain. However, one test in particular caught my eye because I had never heard of it before and it had the best accuracy of all the tests studied. This test goes by the pragmatically descriptive name of the “Take-the-shoe-off-test.” Here is the description. The Taking-off-the-shoe-test” was the most accurate test with a perfect sensitivity and specificity of 1. It was able to correctly diagnose every person in the study. Compared to the other tests it was a standout. The review authors however were not so impressed with this result because the study which investigated the “Taking-off-the-shoe-test” was not very rigorous. This study was conducted in Turkey by Bulent Zeren, MD and Haluk H. Oztekin, MD and published in 2006 in the Clinical Journal of Sports Medicine. Zeren et al. selected 140 male pro soccer players with ultrasound confirmed grade I or II hamstring strains and used their uninjured leg as the control. It was unblinded and retrospective as both the players and the physicians knew that a hamstring strain was present ahead of time. Therefore this study can’t tell us what we really want to know which is whether this test works when the diagnosis is not so clear. On the other hand. the authors also conducted active, passive and resisted range of motion tests on the injured athletes. They found that the other tests were often negative when they should have been positive. That is, their sensitivty values were relatively low. This makes the “Taking-off-the-shoe-test” look good by comparison. Here is the data comparing the tests. Zeren et al. conducted the test every week for six weeks after the first testing. Test accuracy began to decrease at two weeks after injury and by 35 days none of the tests were positive. Therefore, these tests can’t be used to reliably diagnose old hamstring injuries. Furthermore, since hamstring strain takes an average of 16 weeks to return to competitive sport, and more severe strains can take as long as 50 weeks, these tests can not be used to determine readiness to return to sport. Simple clinical tests are not as accurate in identifying hamstring strain injuries as magnetic resonance imaging techniques or diagnostic ultrasound. The ”Taking-off-the-shoe-test” looks promising but needs to be investigated in a prospective, randomized and double blinded study design to determine if it can be used as a substitute for imaging. In the meantime I think it is helpful to note that all the hamstring tests have high specificty but low sensitivity meaning that you can trust them when they are positive but not when they are negative. *A hamstring strain is a tear of the muscle which can be identified on MRI or ultrasound by the muscle damage and inflammation in the area. The “Modified-bent-knee-stretch test” was the second most accurate test with sensitivity of 0.89 and specificity of 0.91. Here is the abstract of the systematic review by Reiman. – Zeren B, Oztekin HH. A new self-diagnostic test for biceps femoris muscle strains. Clin J Sport Med. 2006;16:166-169.